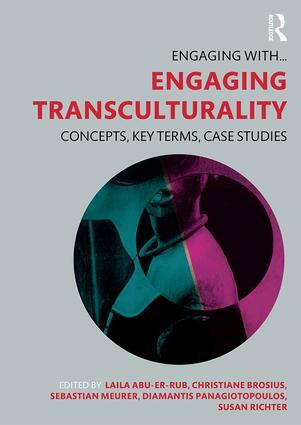 Engaging Transculturality is an extensive and comprehensive survey of the rapidly developing field of transcultural studies. In this volume, the reflections of a large and interdisciplinary array of scholars have been brought together to provide an extensive source of regional and trans-regional competencies, and a systematic and critical discussion of the field’s central methodological concepts and terms. Based on a wide range of case studies, the book is divided into twenty-seven chapters across which cultural, social, and political issues relating to transculturality from Antiquity to today and within both Asian and European regions are explored. Key terms related to the field of transculturality are also discussed within each chapter, and the rich variety of approaches provided by the contributing authors offer the reader an expansive look into the field of transculturality. Offering a wealth of expertise, and equipped with a selection of illustrations, this book will be of interest to scholars and students from a variety of fields within the Humanities and Social Sciences. Translating Jesuits–translation as a useful tool to explore transculturality? Laila Abu-Er-Rub holds a PhD in anthropology from Heidelberg University and currently works as coordinator of the interdisciplinary Indo-German Centre for Advanced Studies ICAS:MP in New Delhi. Her research interests are visual and material culture, gender, and more particularly advertising, fashion studies and colourism. Christiane Brosius is Professor of Visual and Media Anthropology at the Heidelberg Centre for Transcultural Studies. Her research interests are urban transformation, lifecourse studies, art production and cultural heritage in South Asia (especially Nepal and India), as well as critical area studies and mobilities studies. Sebastian Meurer, PhD, is the Academic Project Manager of the Collaborative Research Centre 948 ‘Heroes – Heroizations – Heroisms’ at the University of Freiburg. He specializes in intellectual, constitutional, and administrative history since the seventeenth century with a focus on Britain and the British Empire. Diamantis Panagiotopoulos is Professor of Classical Archaeology at the University of Heidelberg. He has published two books, five edited volumes and 80 papers in journals and collective volumes with a strong focus on the dynamics of transcultural interaction in the Eastern Mediterranean in the second millennium BCE. Susan Richter is Acting Professor for Early Modern History at the University of Heidelberg. She has published two books, five edited volumes and more than 30 papers in peer-reviewed journals and books on early modern intellectual and administrative history, dynasties and state building in Europe and Asia. ‘Engaging with...’ is a series of big, multi-contributed volumes with between 25 and 40 contributors and up to 350,000 words in length. These volumes are typically broken into three parts, Concepts, Key Terms/Methodologies and Case Studies, and they are designed to provide a reference work for researchers and students for exciting new topics. Books in this series cover the key concepts of the field or approach being studied, and contain analysis of the significant terms being used, as well as providing case studies of research currently being done. They are the perfect opportunity to bring together the work of established academics, early career academics and postgraduate students.